U.S. Border Patrol agents take a father and son from Honduras into custody at the U.S.-Mexico border near Mission, Texas, on Tuesday. The concerned pediatricians contacted Colleen Kraft, president of the American Academy of Pediatrics, and she flew to Texas and visited a shelter for migrant children in the Rio Grande Valley. There, she saw a young girl in tears. "She couldn't have been more than 2 years old," Kraft says. "Just crying and pounding and having a huge, huge temper tantrum. This child was just screaming, and nobody could help her. And we know why she was crying. She didn't have her mother. She didn't have her parent who could soothe her and take care of her." President Trump and Attorney General Jeff Sessions say the administration is enforcing immigration law. But House Republicans plan to vote next week on a bill that they say would end the practice of separating children from their parents. Pediatricians and immigrant advocates are warning that separating migrant children from their families can cause "toxic stress" that disrupts a child's brain development and harms long-term health. While shelter managers and other experts say there is no such rule, Kraft says the confusion underscores why these shelters are not the right place for young children — especially kids who have fled dangerous countries and who have just been separated from their parents. "By separating parents and children, we are doing irreparable harm to these children. The long-term concern of what we call toxic stress is that brains are not developed efficiently or effectively," Kraft says. "And these children go on to have behavior problems, to have long-term medical problems." Critics of the Trump administration's "zero tolerance" policy that leads to the separation of migrant families say it leaves parents in a no-win situation. They can try to get asylum in the U.S. and risk being separated from their children, or they can go back to the countries they fled. "It's a moral issue. It's an ethical issue. But I think it's also a significant logistical challenge," says Robert Carey, who ran the Office of Refugee Resettlement under the Obama administration. That agency is charged with caring for these kids temporarily until they can be placed with sponsors or foster families. It oversees a network of about 100 shelters in 14 states. Until now, the vast majority of the migrant children in those shelters — more than 80 percent — were teenagers. Many arrived at the border on their own and knew what to expect. They would spend a month or two in a shelter before being placed with a relative in the U.S. — often their own parents. But Carey says the number of kids under 13 is growing. "Given the trends that we're seeing, the number of small children coming into care is only likely to increase," he says. And these "tender age" children, as the government refers to them, are coming to these shelters under very different circumstances than the teenagers who arrived at the border alone. "Kids started appearing at the shelter who didn't 'know the drill.' They had just been separated from their parents, so they were experiencing an increased amount of trauma," says Antar Davidson, who worked for Southwest Key, a nonprofit that operates more than two dozen shelters for migrant children from Texas to California. Davidson quit this week because the shelter where he worked in Tucson, Ariz., didn't have the trained staffing to handle the influx of younger, more traumatized children, he says. The breaking point for Davidson came, he says, when he was asked to tell two siblings, ages 6 and 10, that they couldn't hug each other. "They called me over the radio. And they wanted to translate to these kids that the rule of the shelter is that they are not allowed to hug," he says. "And these are kids that had just been separated from their mom — basically just huddling and hugging each other in a desperate attempt to remain together." Southwest Key says it has a clear policy that allows touching and hugging in certain circumstances. Alexia Rodriguez, the company's vice president of immigrant children's services, says Southwest Key's facilities are licensed and adequately staffed. And they have worked for years with migrant children, many of them traumatized. "We love the kids. We have experienced staff to provide comfort, counseling. And help the child feel more comfortable," she says. Asked if that meant it's "absolutely OK to hug them," Rodriguez replies: "Absolutely. I was at one of our shelters last week that has babies and preschoolers, and I walked around holding a baby the entire time I was there. And that's what you would see." The Office of Refugee Resettlement says there are now more than 11,000 children in its shelters. Almost half of them are in facilities run by Southwest Key, including several hundred who are 12 or younger. Rodriguez says Southwest Key is preparing for hundreds more to arrive by adding beds and hiring more staff. The number of migrant children detained by the U.S. government alone is increasing. That's the result of a policy decision by the Trump administration to separate children from their parents as the parents are prosecuted for crossing the border. Hundreds of the kids affected are under age 13. So how's the policy affect them? 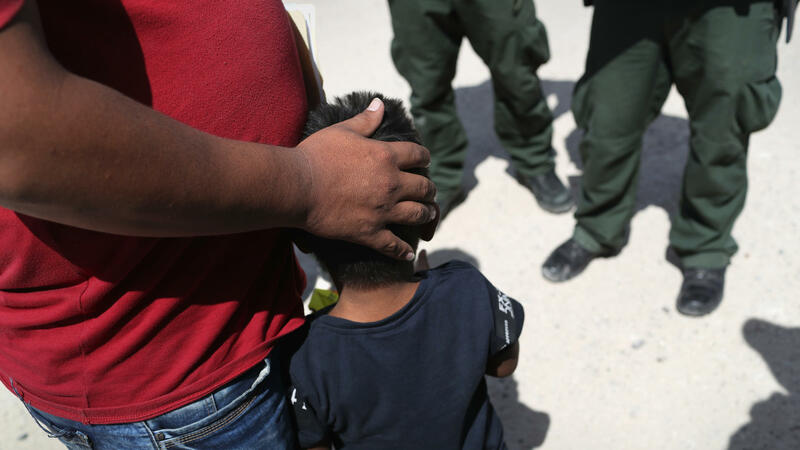 Pediatricians and immigrant advocates warn that these separations can cause what they describe as toxic stress - disrupting a child's brain development and harming long-term health. NPR's Joel Rose reports. JOEL ROSE, BYLINE: Pediatricians in South Texas started sounding the alarm weeks ago when migrant shelters began filling up with younger children - kids who'd recently been separated from their parents after they crossed the U.S.-Mexico border illegally. COLLEEN KRAFT: I was contacted by several pediatricians in the area who were really concerned. ROSE: Colleen Kraft is president of the American Academy of Pediatrics. At the urging of her colleagues, Kraft flew to Texas and visited a shelter in the Rio Grande Valley where she saw a young girl in tears. KRAFT: She couldn't have been more than 2 years old - just crying and pounding and having a huge, huge temper tantrum. And this child was just screaming, and nobody could help her. And we know why she was crying. She didn't have her mother. She didn't have her parent who could sooth there and comfort her and take care of her. ROSE: Kraft says the staff at the facility told her that federal regulations prevented them from touching or holding the child to soothe her. Shelter managers and other experts say there is no such rule. But Kraft says the confusion is just one reason why these shelters are not the right place for young children - especially kids who've fled some of the most dangerous countries on Earth and who've just been separated from their parents. KRAFT: By separating parents and children, we are doing irreparable harm to these children. The long-term concern of what we call toxic stress is that brains are not developed efficiently or effectively. And these children go on to have behavior problems, to have long-term medical problems. ROSE: Medical professionals, members of Congress and religious leaders are calling on the Trump administration to stop separating migrant families. They say it's leaving parents in a no-win situation - try to get asylum in the U.S. and risk being separated from their children or go back to the countries they fled. ROBERT CAREY: It's a moral issue. It's an ethical issue. But I think it's also a significant logistical challenge. ROSE: Robert Carey ran the Office of Refugee Resettlement under the Obama administration. The agency is charged with caring for these kids temporarily until they can be placed with sponsors or foster families. It oversees a network of about 100 shelters in 14 states. Until now, the vast majority of the migrant children in those shelters - more than 80 percent - were teenagers. Many arrived at the border on their own, and they knew what to expect. They would spend a month or two in a shelter before being placed with a relative in the U.S. - often their own parents. But Carey says the number of kids under 13 is growing. CAREY: Given the trends that we're seeing, the number of small children coming into care is only likely to increase. ROSE: And these tender-age children, as the government refers to them, are coming to these shelters under very different circumstances than the teenagers who arrived at the border alone. ANTAR DAVIDSON: Kids started appearing at the shelter who didn't, quote, unquote, "know the drill." They had just been separated from their parents, so they were experiencing an increased amount of trauma. ROSE: Antar Davidson worked for Southwest Key, a nonprofit that operates more than two dozen shelters for migrant children from Texas to California. He quit this week because he says the shelter where he worked in Tucson, Ariz., didn't have the trained staff to handle the influx of younger, more traumatized children. The breaking point for Davidson came when he says he was asked to tell two siblings, ages 6 and 10, that they couldn't hug each other. DAVIDSON: They called me over the radio. And they wanted me to translate to these kids that the rule of the shelter is that they are not allowed to hug. And these are kids that had just been separated from their mom - basically just cuddling and hugging each other in a desperate attempt to remain together. ROSE: Southwest Key says they have a clear policy that allows touching and hugging in certain circumstances. Alexia Rodriguez is the company's vice president of immigrant children services. She says these are licensed facilities that are adequately staffed and have worked for years with migrant children - many of them traumatized. ALEXIA RODRIGUEZ: We love the kids. We have experienced staff to provide comfort, counseling and help the child feel more comfortable. ROSE: You're telling me that it's absolutely OK to hug them? RODRIGUEZ: Absolutely. I was at one of our shelters last week that has babies and preschoolers. And I walked around holding a baby the entire time I was there. And that's what you would see. ROSE: The Office of Refugee Resettlement says there are more than 11,000 children in its shelters. Almost half of them are in facilities run by Southwest Key, including several hundred who are 12 or younger. Alexia Rodriguez says Southwest Key is preparing for hundreds more to arrive by adding beds and hiring more staff. Joel Rose, NPR News. (SOUNDBITE OF D&Z'S "BEAUTY") Transcript provided by NPR, Copyright NPR.